As a health resort the Victorians called Church Stretton "little Switzerland" but with its alpine like hills and valleys its easy to see why. Church Stretton still retains its spa town feel with natural springs providing the source of Stretton Hills bottled water. Above the town rises the Long Mynd which is topped by a moorland plateau of heather and rocks, broken on the eastern side by a series of "batches" or hollows. 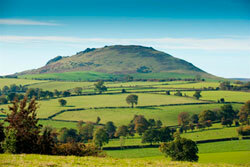 A popular walking area - ideal for exploring the Shropshire Hills. Church Stretton is the first town in Shropshire to receive Walkers Welcome status. Walkers Welcome towns are places which have something special to offer for walkers more than simply being a fantastic place to come and enjoy the great outdoors. The town also holds its own annual Walking Festival in June. Carding Mill Valley provides a more leisurely walk popular with visitors and a tea pavilion for that all important brew. At weekends and Bank Holidays the National Trust run a shuttle bus from the railway station to the valley and up to the top of the Long Mynd. The sensible folk take it up and walk back - its easier that way.